In the 16th and 17th centuries many towns in Europe had their own instrumental ensemble. They we known as town waits in England, Ratsmusik and Stadtpfeifer in Germany. The ministriles which played a major role in the music scene in Spanish towns are comparable to them. Like their counterparts in other countries they played at official events of the town, but also in the homes of members of the upper echelons of society. In Spain they also participated in the liturgy. 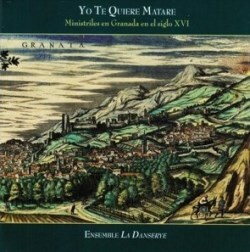 The present disc presents pieces from a number of sources, especially a manuscript known as Manuscrito 975 from the Biblioteco Manuel de Falla in Granada. This explains the subtitle of this disc. However, one may assume that the repertoire and performance practice in other towns was not fundamentally different. The second section includes music which could have been played during festivities of the university - founded in 1526 by Charles V - and on occasion of graduation ceremonies. The university's statutes of 1542 make mention of the participation of ministriles. "The wind bands performed from the windows of the University cloister, as well as at Vespers, at Masses as in processions for which they generally rode horseback" (booklet). The various roles explain the mixture of sacred and secular pieces in this section. The third chapter is devoted to music played in domestic surroundings. It comes as no surprise when Juan Ruiz Jiménez writes in his liner-notes that "[music] in private homes is the least well-known". Obviously this was not well documented and there are only hints of what might have been played and at what kind of occasions. Jiménez refers to documents which attest to musical activities in the house of the Count and Countess of Tendilla, the Marquis and Marquise of Mondéjar, including the presence of ministriles. It is also mentioned that the wind band of the Cathedral was given permission to attend the "banquet of His Lord, Don Juan of Austria". It seems likely that wind bands also played in theatres but hardly anything is known about their role. In this section we hear only secular music. That is also the case in the last section: music for the streets and squares. This is not so much about playing to entertain the people in the streets but rather about music played at specific public occasions. "[Institutions] and nobility presented themselves to their fellow citizens in the company of wind bands who acted as heraldic representatives or helped to convey a greater sense of ceremonial solemnity with their processional parading". This is in line with what we know about the role of music across Europe: it was a way to show power and status. Again it is not known exactly what kind of music was played. Here only secular music is performed, but I would imagine that sacred music was also part of the repertoire. Let us not forget that in Spain religion was very much a part of everyday life, and not just something boxed up within the walls of the church. There is a third reason why I draw attention to this disc: performance practice. The interpreters have thoroughly studied the available material about this issue, and I am impressed by their meticulous research. I mention one aspect: the use of iconographic evidence. Too often paintings or drawings are used as evidence for decisions in regard to performance practice. The notes on performance practice in the booklet - more than three densely printed pages - rightly warn about too hasty conclusions: "[One] must be cautious (...) and make sure the images represent real scenes from real life and are not simply symbolic allegories". I refer here to what was written before about the role of music as a form of representation. The ensemble's research is especially important in regard to the line-up of the various consorts. The recorders and crumhorns are used here only as a whole consort: both instruments were built in various sizes and tessituras. They are never played in ensembles with cornetts, sackbuts and dulcians. These instruments are played here in the form of a broken consort, for instance with three shawms and two sackbuts (Juan de Urede, Pange lingua), one cornett, two shawms and two sackbuts (Francesco Guerrero, O quam super terram) or one cornett, one sackbut and two dulcians (Gombert, J'ay congé prins). Another issue is the difference of instrumental combinations between the sections of a single piece. I am inclined to be sceptical about this as I feel that it breaks up its unity but it seems to have been practised, as can be concluded from an edict by Francisco Guerrero for Seville Cathedral of 1586 which is quoted in the booklet. Other issues are the application of ornamentation, musica ficta and the choice of tempo. As far as the latter is concerned, it is concluded from the sources that a strict tempo was observed, without slowing down in the final cadence.